Ecuador as a travel destination has been on my mind since I was in elementary school--55 years later, I finally made it. Quito is less than 4 hours from Miami. Unfortunately from California, it takes much longer just to get to Miami. Ecuador's proximity is convenient as is the fact that they use US dollars. In 1999, the government weary from monetary devaluation, adopted the US dollar for their currency. In fact, quite a number of USA and Canadians have chosen to retire to Ecuador to take advantage of a lower cost of living. Even with its 2865 meter/9400 foot elevation, Quito's climate is quite temperate because the equator runs right through Ecuador--hence the name. Our first full day in Quito was a free day. We arranged a tour, but I stayed in our hotel room flat on my back except when I was praying to the porcelain goddess in the bathroom. Not sure what happened, but I was sick. Dan took the tour. My first day and Dan's second day was mostly spent touring Quito's historical center to see beautiful churches, city squares, and lunch. Quito's historical center was declared a UNESCO World Heritage Site in 1978. 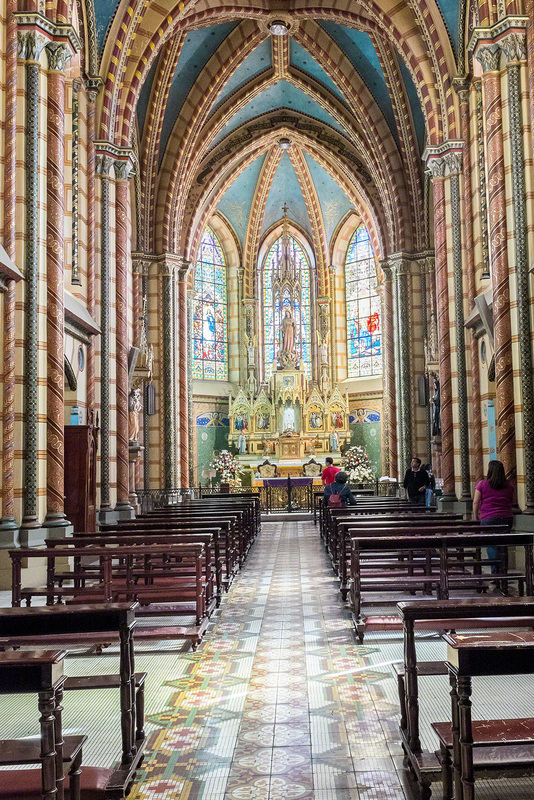 The first church we visited, referred to as Quito's Sistine Chapel, was La Compañía de Jesús. 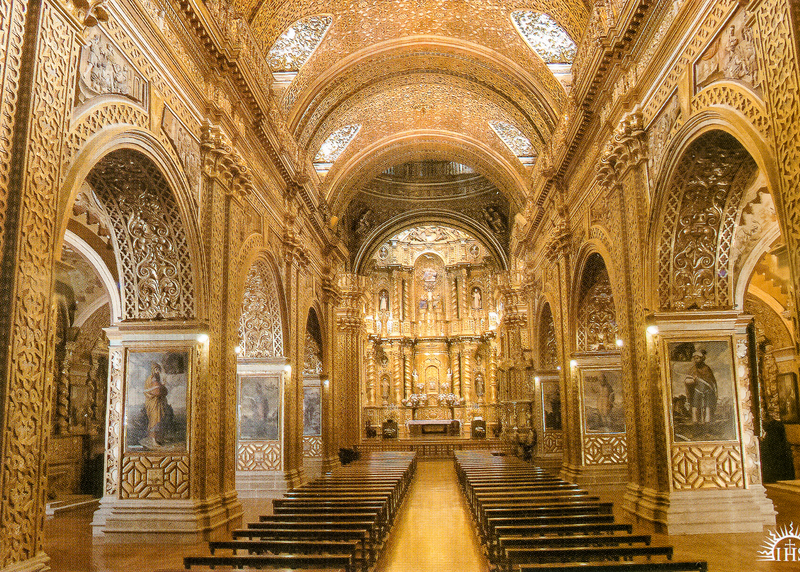 Construction spanned 160 years (1605-1765) and its Baroque interior is covered with seven tons of gold. No photos of the interior were allowed, but this postcard shows its magnificent golden interior. We visited a newer church, La Bascilica del Voto Nacional, with its fabulous gargoyles shaped like many of the animals that can be found in Ecuador. There were birds, Galapagos tortoises, armadillos, iguanas.... Construction began in 1892 and continued for over 100 years as money for building became available. The interior, although it did not glitter with gold, was lovely and serene; photos were not a problem. We did some people watching as we strolled around Plaza San Francisco which is bordered by the Ecuadorian "White House", another cathedral with the oldest colonial edifice in the city, and restaurants. The lion in the square's central monument symbolizes Spain being tossed out. A group of young photographers were taking portraits of the people relaxing in the square. Then lunch at a restaurant overlooking the square included a vaporous sherbet dessert delivered by a waiter dressed in a purple hood and robe. The purple hood and robe was once worn by wealthy penitents (cururochos) to disguise their identities while walking in the Good Friday procession. They vowed to change their ways, but didn't want anyone to know who they were. Another stop to view the city; this time from El Panecillo and the 30-meter statue of the Virgin Mary standing on a dragon. The view of Quito encompassing the Old Town from El Panecillo was spectacular with buildings as far as the eye could see. On the way back to our hotel (in the New Town), the traffic was so bad, we got out of the car and walked through a craft market on the way back to our hotel. Roses are one of Ecuador's big exports. The lobby of our hotel had multiple large arrangements of fabulous export-quality roses. We had a couple of delicous dinners at the hotel and also at the nearby restaurant La Choza.